Serious shooters know that buying ammo by the case is a great way to both save money and hone their skills by getting lots of practice time in. 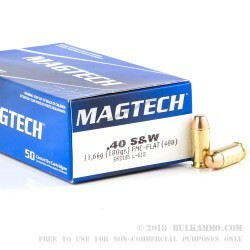 This 40 cal ammo made by Magtech provides a great value for high volume shooters looking to put some serious rounds down range. 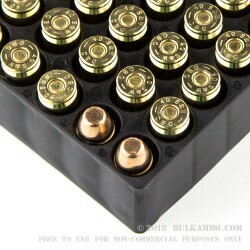 This ammo features boxer-primed, reloadable brass casings topped with 180 grain full metal jacket bullets with a flat nose profile. This ammo is not attracted to a magnet so it's good to go for ranges that prohibit "magnetic ammo". 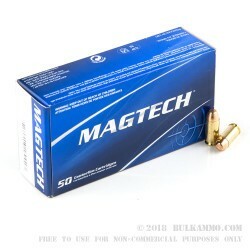 Magtech ammo is made in Brazil and has built a reputation for reliable quality at a reasonable price point. Magtech makes their own primers and brass and by controlling the components going into their ammo they can produce highly consistent ammo at a competitive price point. A good company to do business with. I will be buying more ammo from them in the future. The Mag Tech ammo shoots good and with no malfunctions. fired 300 rounds so far out of the 1000 bulk pack ordered and not a problem. Using an SA, XD subcompact. Hi! I bought 1000 rounds of this ammom and, so far, have fired 450 of them on my Hi-Point 4095 carbine without a single problem. Excellent reliability. very clean ammo and a decent price. might b my glock 23, doubt it. THE BEST DEALS ON AMMO,FAST SHIPPING & HANDLING & EXCELLENT CUSTOMER SERVICE. Fast two day shipping! Good prices. GREAT PRICES, FAST SHIPPING & HANDLING & GOOD FRIENDAY CUSTOMER SERVICE. GREAT PRICES,EXCELLENT & FRIENDLY CUSTOMER SERVICE. STANDARD SHIPPING HAVE YOUR PRODUCT WITHIN TWO OR THREE BUSINESS DAYS. GREAT PRICE, GREAT SERVICE & EXCELLENT AMMO. dependable clean ammo. no hassles. For target rounds, you can't go wrong. The price is right and I haven't had any issues thusfar. The delivery was fast as well - great experience! 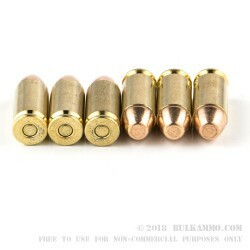 Q: 2 questions: what are the ballistics on these FMJ rounds and are they new factory loads or reloads? A: Hello Jon! Magtech lists this round as having a muzzle velocity of 990 fps with a muzzle energy of 390 ft. lbs. This ammunition is all new manufacture from Magtech and is made in the CBC ammunition plant in Brazil.